This data set reports methane (CH4) fluxes at the water–air interface and concentrations and isotopic signals of CH4 in the bubbles stirred up from the sediment in Tucurui and Samuel reservoirs in 2000 and 2001. Tucurui (deep) reservoir is located near Belem city in the Tocantins-Araguaia basin in the eastern Amazon. Samuel (shallow) reservoir is situated near Porto Velho city in the Jamari River, a tributary of the Madeira River in the western Amazon. Field samples were collected between June 2000 and September 2001. There are two comma-delimited ASCII data files in this data set. This study was carried out to identify differences in methane cycling between deep and shallow reservoirs (Lima, 2005). Isotopic and concentration analyses of methane in bubbles, dissolved in the water column, and emitted to the atmosphere demonstrate that water depth is critical regarding methane emissions from hydroreservoirs in the Amazon. Methanotrophic activities are greater in Tucurui (deep) while light isotopic methane is directly released from Samuel (shallow). Therefore, the methanotrophic layer of the deep reservoir is more efficient in oxidizing methane before reaching the atmosphere, since the quantity of methane in the sediments of the reservoirs were equivalent. The investigator was Lima, Ivan Bergier Tavares de. You may contact Lima, Dr. Ivan Bergier T. (for science) (ivan@cpap.embrapa.br) and Gastil-Buhl, M. (for data) (gastil@lifesci.ucsb.edu). This data set reports methane (CH4) fluxes at the water–air interface and concentrations and isotopic signals of CH4 in the bubbles stirred up from the sediment in Tucurui and Samuel reservoirs in 2000 and 2001. Tucurui (deep) reservoir is located near Belem city in the Tocantins-Araguaia basin in the eastern Amazon. Samuel (shallow) reservoir is situated near Porto Velho city in the Jamari River, a tributary of the Madeira River in the western Amazon. Field samples were collected between June 2000 and September 2001. This data set contains two comma-delimited ASCII data files. This file provides average daily chamber CH4 fluxes at the water–air interface in Tucurui and Samuel reservoirs in 2000 and 2001. Notes: Each field campaign accomplished four days of sampling by reservoir. 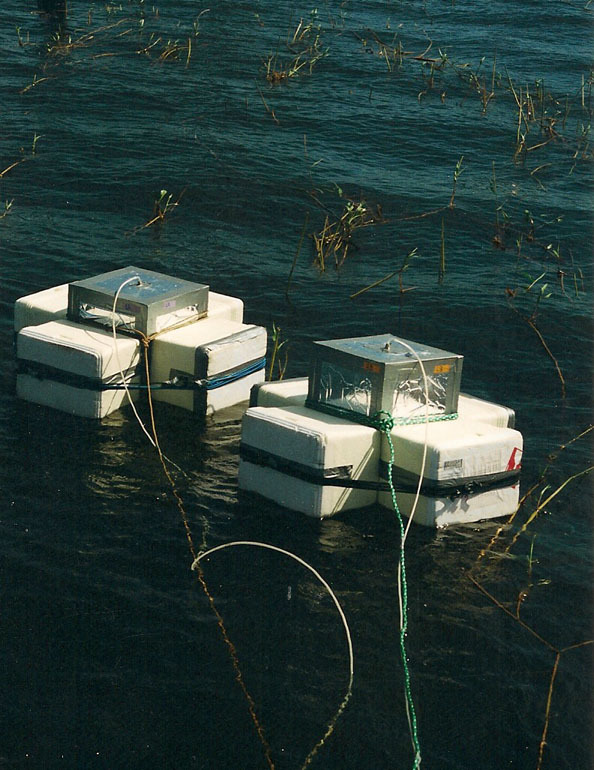 Eight methane fluxes per day were obtained using two floating static chambers. By averaging two simultaneous chamber fluxes, up to four mean methane fluxes per day were estimated, gathering a maximum of 16 mean methane fluxes by reservoir for each of the three field campaigns. There are no missing values. This file provides average ± standard deviation of chamber CH4 fluxes at the water–air interface and concentrations and isotopic signals of CH4 in the bubbles stirred up from the sediment in Tucurui and Samuel reservoirs in 2000 and 2001. Notes: Each field campaign accomplished four days of sampling by reservoir. Eight methane fluxes per day were obtained using two floating static chambers. By averaging two simultaneous chamber fluxes, up to four mean methane fluxes per day were estimated, gathering a maximum of 16 mean methane fluxes by reservoir for each of the three field campaigns. The number -999 denotes missing values. Recent studies have shown that methane emissions from hydroelectric reservoirs may comprise a considerable fraction of the anthropogenic atmospheric methane. Data from this study may contribute information on the role of hydroreservoirs in the Amazon region, where about 77% of the hydroelectric energy potential remains unexploited, in the framework of climate change and global warming. Further research may identify key climate variables responsible for similar seasonal and inter-annual variability of both methane production in the sediments and methane fluxes in the water–air interface. The Methane concentration average analytical error was ca. 3 - 5%. Analytical uncertainties in methane isotopic analyses were lower than 1 in per mil notation (0/00). Floating static chamber measurements illustrated that methane emissions to the atmosphere from Amazon hydroreservoirs were particularly variable. A Kruskal–Wallis test, a nonparametric version of One-way ANOVA, showed that emissions were significantly different between the three field campaigns in both Tucurui (p < 0.016) and Samuel (p < 0.006). Maximum emissions took place in June–July 2001, and lower fluxes were observed in June–July 2000 and in September 2001. Methane concentrations in sediment bubbles are equivalent to the quantities of methane released to the atmosphere (R = 0.99 and R = 0.97 for Tucurui and Samuel, respectively). In both reservoirs, bubble methane concentrations were ca. 600 mM in June–July 2001, one order of magnitude larger than concentrations observed in June–July 2000 and September 2001. Higher methane emissions occurred in June–July 2001, precisely when greater quantities of methane were present in the sediments of both reservoirs. Methane isotope ratio in the sediment bubbles, dissolved in the water column, and emitted to the atmosphere at Tucurui and Samuel reservoirs were comparable to values typically verified in freshwater environments. Tucurui reservoir is located near Belem city in the Tocantins-Araguaia basin in the eastern Amazon. The reservoir was formed in 1984 covering about 2,800 km2 with an average depth of approximately 20 m. Samuel reservoir was formed in 1989 and is situated near Porto Velho city in the Jamari River, a tributary of the Madeira River in the western Amazon. It has about 60 km of barriers, which reduced about 80% of the potentially flooded area. As a result, Samuel reservoir has roughly 560 km2 and mean depth around 6 m. Water residence time is close to 100 days, twice that determined for Tucurui. Physical and chemical properties of the reservoirs are comparable. Water is typically clear with pH around 7.0 near the surface, and 6.0 to 6.5 in the hypolimnion. The concentration of organic carbon in both reservoirs is approximately 4.0 mg/l. In contrast, inorganic carbon is about 20 mg/l in Tucurui, double that determined in Samuel, due to the inorganic carbon inputs from Tocantins and Araguaia rivers. Static chamber fluxes were estimated during three field campaigns carried out in June–July 2000, in June–July 2001, and in September 2001. Methane fluxes were acquired relatively far from the shoreline of both Tucurui and Samuel reservoirs. Each field campaign accomplished four days of sampling by reservoir. It was obtained eight methane fluxes per day using two floating static chambers. By averaging two simultaneous chamber fluxes, four mean methane fluxes per day were estimated, gathering a maximum of 16 mean methane fluxes by reservoir for each of the three field campaigns. Each chamber has a headspace volume of 36,000 cm3 and an exchange area of 1,000 cm2. Both chambers were covered with reflective material to minimize the increase of inside temperature during deployments of 1 h. Samples were pumped every 15 min from 5-m length and 3-mm inner diameter nylon tubing with the aid of 60- ml plastic syringes adapted with luer-lock valves. Gas samples were then stored by needle injection in 15-ml pre-evacuated glass flasks sealed with butyl rubber stoppers for later concentration determination. Methane concentration was determined with a flame ionization detector (FID) in a Shimadzu 17A gas chromatograph (GC). Around 1–3 ml of gas sample was injected in the GC system, composed of a system port at 150 degrees C, a 0.53-mm diameter and 30-m length Megabore column at 45 degrees C, and a FID at 200 degrees C. Average analytical error was ca. 3–5%. Methane fluxes were calculated by (phi) = (Δc/Δt) · (V/A), where Δc/Δt is the rate of methane concentration change into the chambers. All fluxes (phi) < 0 were discarded of the analysis, since, in terms of energy conservation, Δc/Δt < 0 may represent physically improbable fluxes. Methane bubbles eventually intercepted some time series. When bubbles interfered in the beginning of the deployment, the disturbance created a negative rate, due to mixing within the chamber and thus dilution of the bubbles close to the atmospheric methane concentration. For those cases, methane fluxes were also discarded. Methane bubbles were sampled in the three field campaigns by stirring up the sediments. Arising bubbles were collected with an entirely submerged 25-cm diameter inverted plastic funnel. The open narrow end of the funnel was sealed with a rubber stopper of 3-cm diameter. With a needle, bubble gas samples were pumped into a 60-ml plastic syringe adapted with a luer-lock valve and thereafter injected in pre-evacuated 15-ml glass flasks sealed with butyl rubber stoppers for later FIDGC analysis. In June–July 2001 gas samples were collected for dissolved methane analysis in the epi, meta and hypolimnion of both reservoirs. Using a headspace equilibrium technique presented by McAullife (1971), a 60-ml plastic syringe adapted with a luer-lock valve containing 30 ml of water sample and 30 ml of pure nitrogen was vigorously shaken during 2 min, transferring the dissolved phase to the nitrogen headspace. The headspace was then injected with a needle in pre-evacuated 15-ml glass flasks sealed with butyl rubber stoppers for later FID-GC analysis. After the FID-GC analysis, the remaining gas contained in the 15-ml glass flasks acquired in June–July 2001 from the emitted CH4 (chambers), CH4 in the water column and CH4 in the sediment bubbles was employed for δ13C–CH4 analysis in a PreCon system Finnigan Mat) in line with a mass spectrometer Finnigan Delta-Plus (Merritt and Hayes, 1995). Isotopic analysis of methane consisted of trapping CO2 from samples in liquid nitrogen, and then of the oxidation of methane at 1,000 degrees C. The carbon isotopic ratio of the oxidized methane (δ13C–CO2) was then determined and expressed by δ13C = [(Ra/Rp) - 1]1,000 in per mil notation (%), where R denotes the 13C/12C ratio for the sample a and for the standard p (Pee Dee Belemnite, PDB). Analytical uncertainties were lower than 1%. Lima I.B.T. 2005. Blogeochemical distinction of methane releases from two Amazon hydroreservoirs. Chemosphere, 59: 1697-1702. Ramos, F.M., I.B.T. Lima, R.R. Rosa, E.A. Mazzi,. J.C. Carvalho, M.F.F.L. Rasera, J.P.H.B. Ometto, A.T. Assireu, and J.L. Stech. 2006. Extreme event dynamics in methane ebullition fluxes from tropical reservoirs. Geophysical Research Letters, 33(21); L21404. Bambace, L.A.W., F.M. Ramos, I.B.T. Lima, and R.R. Rosa. 2007. Emissions from tropical hydroelectric dams. Energy, 32(6): 1038-1046. Lima I.B.T., F.M. Ramos, L.A.W. Bambace, and R.R. Rosa. 2008. Methane emissions from large dams as renewable energy resources: A developing nation perspective. Mitigation and Adaptation Strategies for Global Change, 13(2): 193-206. McAullife, C. 1971. GC determination of solutes by multiple phase equilibration. Chem. Technol. 1(1): 46–51. Merritt, D.A., and J.M. Hayes. 1995. Carbon isotopic analysis of atmospheric methane by isotope ratio-monitoring gas chromatography–mass spectrometry. J. Geophys. Res. 100: 1317–1326.